Your baby’s first steps are one of the most memorable, special moments of parenthood. At 13 months, when Killian walked across our family room and into my arms, I sobbed with a smile on my face. Watching him grow and develop, gaining knowledge and ability and independence is nothing short of amazing. As his legs became more steady and stronger, those first toddling steps quickly turned into running. In just a couple of months it was hard to remember when he was not upright and mobile. Then last month, he stopped walking. When we got home from his 15-month wellness check-up with the pediatrician, I carried him into the house. When I put him down, his left leg seemed to collapse under him. I held him up, gently coaxing him to stand. He refused. He started crying. I didn’t push it. Just as I felt the panic rising in my throat, he got up and ran over to his toys. I was relieved and confused. My most logical conclusion was that his foot fell asleep in the car. For the remainder of the day he was standing and walking normally. Then the next morning, it started again. I noticed he was crawling, which he had not done since he started walking. So again I gently coaxed him to stand. It was obvious that something was wrong with his left leg. He was holding it up the way someone would if they were on crutches. He was solid on his right leg, but would not bear weight on his left. If he tried, he would fall to the floor. He started crying, wanting to be held and soothed. I kissed and hugged him, telling him everything was OK as my mind started to race. What was wrong with my son? Then, just like the day before, all of a sudden he was up and walking. He was instantly back to normal with no apparent pain. What was going on?! This pattern continued for the remainder of the day. Off and on, off and on. Was I going crazy? My husband thought maybe I was. He was traveling for work that week and every time we FaceTimed, Killian was his normal, happy, mobile self. “He looks fine!” Ryan kept saying to me. I was calling my parents too and Killian was also acting normally when they were watching. But I knew something was wrong. Finally, I took a video of one of Killian’s episodes. This validated to my husband and parents that something was up with my son. I placed a call to our pediatrician’s office and while I waited to hear back, I started Googling. (Our doctor always says that we should not search online for medical information. It just causes unnecessary confusion and concern. But I could not help myself.) The results I found for “toddler stops walking” ranged from leukemia to polio, arthritis to appendicitis. The most common result was that it was the side effect of a viral infection. Killian had a couple of pretty bad colds from November to January, but those upper respiratory infections had cleared before this happened. He was healthy. Wasn’t he? I sent a couple of my friends the video. One said that her little girl did the same exact thing when she was recovering from pneumonia and that within a day or so she was walking normally again. Another neighbor of ours is a podiatrist, who rushed over to examine Killian when I reached out to his wife. He confirmed that nothing was broken or dislocated and also said that sometimes kids present these symptoms as a result of a virus. He said get him to the doctor, just to be safe. Even though I was still concerned and confused, the support from these friends provided great comfort, especially while Ryan was away for work. Two days after his wellness check-up we were back at our pediatrician’s office. Over the past 48 hours his leg issue was intermittent. Ninety percent of the time he was acting normally and then bam out of nowhere he was crying, refusing to walk or stand. I was grateful that I had the video to show our doctor so he could see what I had been witnessing because Killian was walking and acting fine while in the exam room. At Killian’s checkup two days prior, he received two booster shots as part of his vaccination schedule. Since his leg issue began right after those shots, I had to ask the doctor: could this be related to the vaccinations he received? Did any other child have a similar reaction? Could something be wrong with that batch of vaccinations? He said that no other children reported these symptoms and during his 30 years of practicing pediatric medicine he had never seen a vaccine cause this reaction. Our pediatrician said that sometimes toddlers can obtain a slight injury without a parent noticing. Maybe he twisted his ankle or knee and the pain was bothering him off and on. He advised monitoring the situation for 24 hours. If it continued after that we would need to go to a specialist. One day later we went to a pediatric orthopedic. The specialist took a detailed history from me. When he performed a thorough examination it was clear that Killian’s left hip was the issue. It had far less mobility than his right and he flinched in pain when the doctor turned it a certain way. The pediatric orthopedic said that he was pretty certain what the ailment was, but wanted to do X-rays to be certain. Once those results were back, showing no issues or fractures I received the diagnosis: toxic synovitis. Killian’s leg issue was a result of a viral infection. The doctor explained that two to six weeks after little ones have a viral infection (like a cold or diarrhea) they can experience joint discomfort, most usually in their hips. The exact reason is not fully understood, but it seems to be a result of the substances made by the immune system to fight off the infection. He said that because of Killian’s upper respiratory infections, toxic synovitis was probably brewing in his system, but the vaccination jump-started the reaction because vaccinations have a small amount of the weakened live virus in them. This, he said, was why Killian stopped walking shortly after his booster shots. The reason it was coming and going was similar to the aches and pains we can feel during the flu: it is not constant and sometimes bothers us a little more or less. 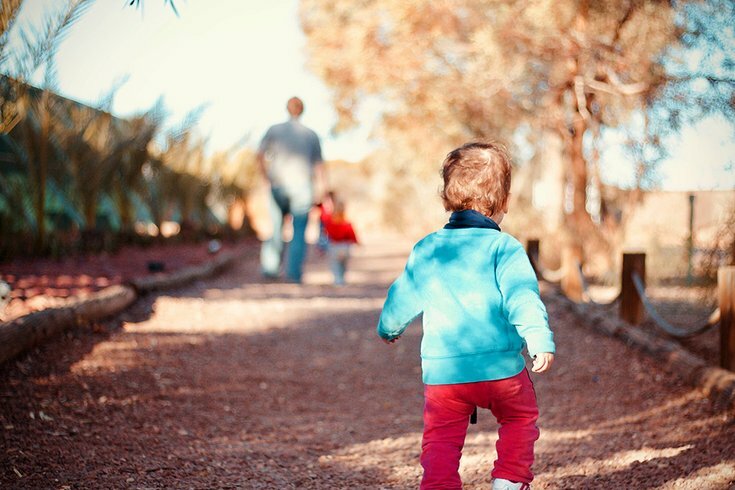 When a toddler stops walking, it can be a sign of something very serious. The news we received that day was an absolute relief. Toxic synovitis is a temporary situation that would not have a long-lasting impact on Killian’s walking or overall health. My son was prescribed Children’s Advil Suspension as an anti-inflammatory and the specialist told me to bring him back in two weeks for a follow-up. He explained that sometimes kids have lost so much mobility due to the pain and stiffness that they can need some physical therapy in order to fully recover. Two weeks later the follow-up showed that Killian was completely healed and needed no additional care. Our nightmare was over. When I was searching online for information about why my one-year-old stopped walking, I found many other parents with similar stories who were just as concerned and confused as me. There’s a lot of scary information online. I am writing about my family’s experience and my son’s diagnosis of toxic synovitis so if other parents are Googling they may read about my son’s story and obtain some comfort at a time of worry. But the only way to help your child is to seek medical attention. If your child has stopped walking, or is experiencing any concerning symptoms, visit your pediatrician or local emergency room. There is no substitute for expert care. Did your toddler stop walking? What was your experience and his diagnosis? Share your stories and ideas in the comments, below and Tweet me at @ThePhillyVoice and @KathleenEGagnon.